Ingathering (296/365) – Annoyingly Boring? 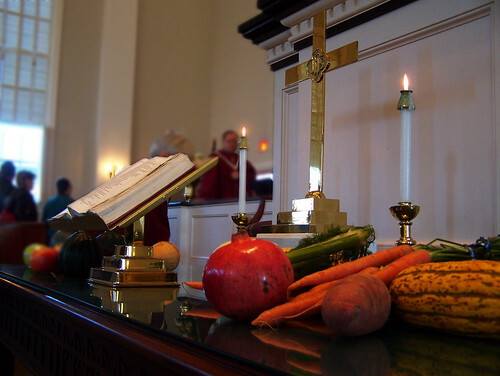 Ingathering Sunday at Old South Union Church, South Weymouth, MA. As the choir processes each member places a fruit or vegetable on the communion table. They are followed by the whole of the Sunday School, each child with some sort of non-perishable to be donated to local food banks. Do Roll-Ups and Tang count as fruit? Can we get an ecumencial ruling on that? I love this photo! All those colorful fruits and veggies. Is that a pomegranate? I don’t know.